Between 7,000 and 9,000 years ago — during the middle Holocene — the Four Corners area went through a slow but dramatic climatic shift. As the region became hotter and drier, stream and lake levels dropped, and larger game animals and firewood became harder to find. Indigenous communities had to rely on foods that were less nutritious and took more time to prepare, such as grass seeds and chenopodium seeds, a tiny grain similar to quinoa. But recently, archaeologists working with local tribes have recognized a surprising addition to these early food sources: Eleven millennia ago, communities at the North Creek Shelter — a rock overhang in southern Utah’s Escalante Valley — began harvesting a unique species of potato. That’s the earliest known use of a potato in North America, and the evidence suggests that the nutritious tuber helped communities adapt to climate change during the middle Holocene, even as other food sources disappeared. Now, this potato — and the Westerners who still harvest it — may hold answers to present-day challenges that face the region, including climate change, food security, and re-establishing tribal connections to the land. Eaten some 11,000 years ago, the Four Corners potato may have been North America's first cultivated plant. The cherry-sized spuds are full of nutrients and calories. Archaeologist Lisbeth Louderback researches the effects of the middle Holocene climate shift on humans’ diets by sifting through plant remains from ancient hearths. By microscope, she identifies the charred seeds, grains, and other leftovers from meals cooked thousands of years ago to understand how people’s diets reflected their shifting worlds. But one set of samples from fire pits built at North Creek Shelter defied her expertise, resembling nothing she could identify. So Louderback tried something unusual: She analyzed the residues left over millennia on manos and metates, grinding stones and surfaces used to prepare corn and other foods, found at the site. She and her colleagues came to a surprising realization: Almost 11,000 years ago, people in the region were eating a species of potato, known as Solanum jamesii, that’s different from the potatoes widely eaten today, Solanum tuberosum. Every type of potato purchased in the store today, whether white, red, or purple, is Solanum tuberosum. The Four Corners species, though, is unique, producing small, hardy tubers from long underground shoots, explains Bruce Pavlik, director of conservation at the University of Utah’s Red Butte Garden. The plant, which has white flowers shaped like stars, grows in the mid-elevation pinyon-juniper and oak forests of the Mogollon Plateau in central Arizona and New Mexico. Though starch grains turned up at North Creek Shelter, it’s not a common plant in Utah. Flowering Solanum jamesii. The plants still grow at ancient settlement sites—and in Four Corners area gardens. After identifying the starch grains on manos and metates as Solanum jamesii, Louderback teamed up with Pavlik and living descendants of the region’s tribal communities to understand how it got there, and where the potato lived today. As Louderback surveyed archaeological sites and materials for traces of plants that were on the menu thousands of years ago, Pavlik inventoried the vegetation growing on the landscape surrounding past and current sites of human habitation. The research team—with help from citizen scientists—has found more potato plants growing near places of human habitation in Utah, with further evidence of ancient use tucked into university herbarium collections. As expected, the potato has been widely collected from the Mogollon Plateau, Pavlik says. But it also has been collected in Mesa Verde, Chaco Canyon, the Escalante Valley, and other regions inhabited by ancient peoples. By talking with descendants of pioneer families and researching the diaries of cavalry soldiers, Louderback and Pavlik learned that pioneers called Escalante Valley “Potato Valley” during the 1800s. Delane Griffin, an Escalante man in his nineties, recollected for the researchers how he and other kids would collect the potato during the Great Depression. Griffin directed the researchers to a place where he’d harvested the potato as a child. “Sure enough, it was still there,” Pavlik says. Delane Griffin in conversation with Lisbeth Louderback in his garden, where today he grows the Four Corners potato. During the Great Depression, Griffin and other children collected the potato for their families. The evidence suggests that ancient peoples introduced the potato around the Four Corners area. “If you were going on a long journey, these tubers were a perfect food source,” Pavlik says. “And then if you arrived at your destination, the thought might occur to you, ‘I could plant these and come back here sometime in the future and have food.’” Pavlik doubts that the story of how the potato originally came to the Four Corners region is a simple one, though. Over the thousands of years that people have lived in the region, communities have shifted. The very shelter where Louderback first collected manos and metates to analyze has been used intensely and abandoned multiple times over the millennia. “How many events were required to establish a (potato) population, if that’s what happened?” Pavlik wonders. It’s a question he hopes to answer through genetic analysis. Pavlik cautions that the researchers need to do more work before they can be confident that ancient peoples intentionally brought the potato to these sites. “We want to look at sites that (the potato) isn’t as well as sites that it is,” he explains. “We can’t just be biased and only look in certain places, because it is still a possibility that it’s a remnant of a natural distribution.” Still, the genetics of the plant also suggest a human connection. After monsoon flowering, wild potatoes in the central part of their range produce fruit resembling tiny tomatoes or eggplants. But the potatoes near archaeological sites only reproduce clonally, by growing more tubers. They seem to have lost the ability to use their flowers for sexual reproduction. “It suggests that those Utah populations — the archaeological ones — don’t have all the genes with them they need in order to complete the sexual process,” Pavlik says. “That would be indirect evidence of having been transported because it means they’ve gone through a genetic bottleneck.” He’s testing this idea in greenhouse experiments by crossing potato plants from archaeological sites with potato plants from the Mogollon Plateau and seeing whether they produce fruit. 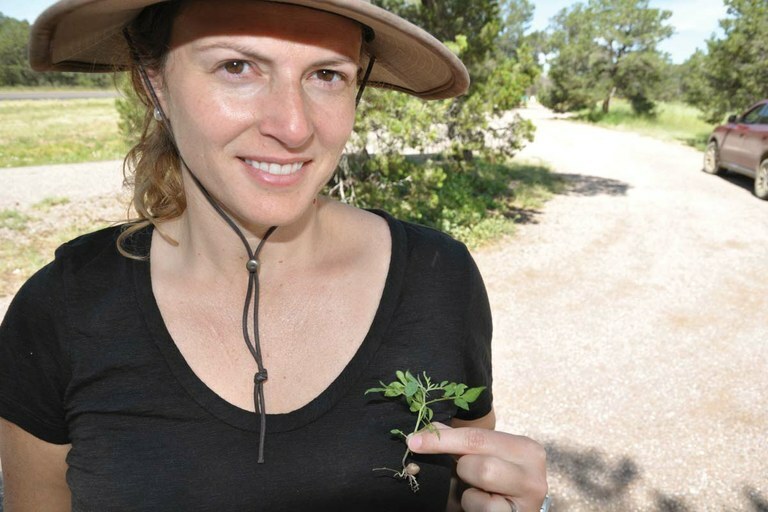 Lisbeth Louderback holds Solanum jamesii with tuber attached to the plant. Either way, this research has revealed this potato to be an enduring food source, capable of persisting through major environmental changes such as drought, Louderback says. These characteristics make it a valuable food crop for all Westerners in a warming, drying climate. The potato’s genetic diversity also could protect the more common Solanum tuberosum from future blights, so something like the Irish potato famine doesn’t happen again. Tribal collaboration has been essential to this research. Louderback and Pavlik work with Utah Diné Bikéyah traditional foods program director Cynthia Wilson to document the occurrence and uses of the potato. Both Louderback and Pavlik support Wilson’s more general goal of reconnecting tribal communities to traditional food resources. “Native Americans have managed the potato for thousands of years,” Louderback says. “It still exists because of them. This is their resource.” Utah Diné Bikéyah is a nonprofit organization that supports the Bears Ears Inter-Tribal Coalition, a group of five tribes working to protect Bears Ears National Monument. Connecting the potato’s current distribution to ancestral history has profound meaning for many of the region’s contemporary tribal inhabitants, some of whom still grow Solanum jamesii today, many others of whom were cut off from traditional food practices through forced relocations. For Wilson, the potato is yet another example of traditional wisdom that’s protected by Bears Ears National Monument, along with petroglyphs, potsherds and ancestral structures. Wilson learned about the potato from her grandfather. He called it “leeyi’ naa’ mááz,” or “rolling around under the soil,” in the Diné language. Tribal communities use the potato less now than they historically did, which Wilson attributes to forced removal from their homelands and the arrival of grocery stores. Yet the potato persists in home gardens of Zunis, Hopis, Jemez people, and Navajos, among others. In addition to further documenting how tribes moved through the Four Corners region over millennia, Wilson says, the potato demonstrates how the designation and design of Bears Ears National Monument assists the region’s tribes in once again accessing traditional — and nutritious — food sources. Louderback has found that S. jamesii has twice the amount of protein and calcium and three times the amount of zinc, iron, and manganese as the potatoes most people eat today. And, according to very unscientific trials by Louderback, the hardy spud is quite delicious if roasted in butter and served with salt and pepper. “It was kind of nutty and earthy and it was really fluffy on the inside and crispy on the outside,” she recalls. It can be bitter, especially if eaten raw; the Hopi prepare it with white clay to draw out the bitterness.